Aug. 27, 2015 1:00 p.m. In May my partner Alex and I went for an overnight hike near the Elk Lakes in eastern B.C.’s Kootenay Mountains. Although the snowfall this winter had been significantly less than the feet upon feet that usually dowses the area in powder, the path we walked was still covered in snow. We stuck to the sides, often walking past and under small trees and bushes. About two hours into the hike, we stopped for a break. I placed my hand on Alex’s neck and instantly recoiled as I felt something out of place on his skin. A tick. I quickly flicked it onto the ground, and we kept on. Over the course of the two days, Alex found nine ticks on his clothes as we hiked. Waking up in our tent, we even found one nestled into my sleeping bag, a freeloader sneakily invading my down cocoon. As we hiked back to the car the next day and continued to find ticks climbing up Alex’s bright purple hiking pants, we marvelled that they were all over him and none were crawling on me. Back at home in Fernie that evening, a stressful situation presented itself, and I habitually ran my hands through my hair. I stopped when I felt an unusual bump at the base of my skull, where a tick had burrowed into my head. Alex took a quick look and confirmed that the tick’s head was lodged in mine, and his little back legs were squirming. After a quick trip to the ER where an excited young nurse exclaimed that I was her “first tick,” the little guy was extracted from my head with tweezers and placed into a plastic container for the remainder of his days. I named him Stu. The idea of a small, multi-legged creature nestling into your skin, bringing along with it the threat of paralysis and disease is unpleasant at the least. With many conflicting messages about the dangers of ticks and differing opinions on the validity of Lyme Disease, what should we know about ticks in this region? The reason ticks bite animals and humans is because they need to use the blood as protein for their egg development. 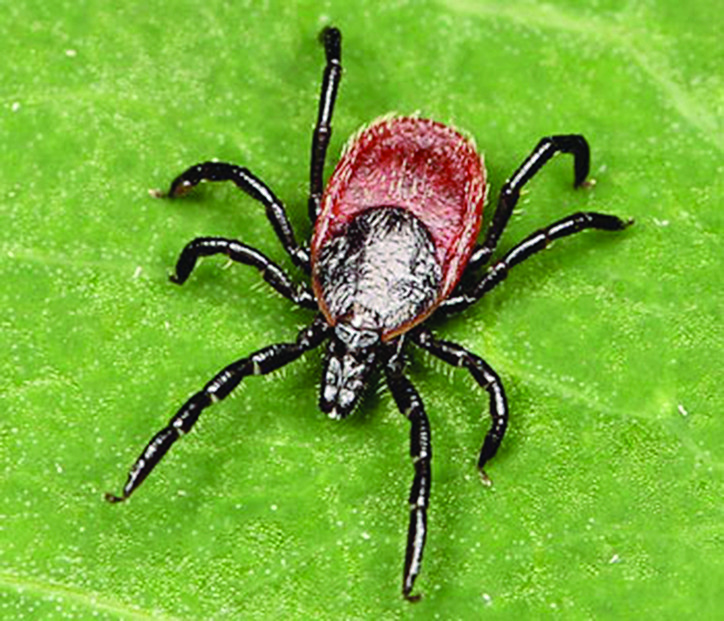 The Western Black-legged Tick is found on Vancouver Island, and the red and black females and smaller black males attach themselves to humans, deer, cats and dogs. This kind of tick won’t cause paralysis, but it does carry the micro-organism that causes Lyme Disease. Surprisingly, less than one per cent of ticks tested in B.C. carry this bacteria. While the chance of ticks transmitting Lyme Disease to humans is very small, the disease can be very serious. While tick folklore says that ticks jump onto their prey, they actually attach to humans and animals as they pass by, they burrow part way into the skin, bite, draw blood and then fall off. When removing a tick, the most important thing is that you get all of it out, especially the mouth. The best way to remove them is to use tweezers or fingers, and pull slowly and gently without twisting. If you are unsure of your ability to do so, going to a doctor as soon as possible is a good idea. About 70-80 per cent of people will develop a skin rash where they were bitten by a tick. The rash will grow in area over a few days, and can be as large as 30 cm, and sometimes forms a bull’s-eye. Other symptoms after being bitten by a tick that can be cause for concern are a fever, headache, muscle pain, paralysis and fatigue. Lyme Disease can become very serious if it is not diagnosed or treated, and complications can range from arthritis to neurological problems. Lyme Disease is in some ways a controversial diagnosis, and some doctors do not recognize it. The Canadian Lyme Disease Foundation says on their website that Lyme victims are often misdiagnosed with other illnesses, and when they are eventually diagnosed correctly, it can be hard to verify because accurate testing is not available in Canada. They go on to explain that some doctors will diagnose a patient with Lyme Disease if they have the bully’s-eye rash, while others want a confirmed blood test before they will begin to treat. However, there are no commercially available blood tests in Canada. There are two antibody tests that can be done as well. Those with Lyme Disease are often misdiagnosed with diseases like chronic fatigue, MS, ALS, Alzheimer’s, and Colitis. While the risks of contracting Lyme Disease are low, it is important to be informed about the symptoms and know how to proactively protect yourself. Try to walk on cleared trails (i.e. avoid what Alex and I did! ), tuck in shirts, pants, and thoroughly check body including scalp both during an outing and after you return. And remember, hiking is fun, but returning with a new friend feeding on your head is not.